Govinda – is the master of the senses. Mastery over the senses is actually mastery over the mind. To control a camera, you must control the mind behind it. The camera is just an instrument. Govinda is the master of our minds.. herding our thoughts as they graze through our senses. Sadhaks get angry.. with themselves when their minds go grazing all over. Some anger improves discipline. Uncontrolled anger is a foe. It saps energy necessary for concentration & then self-realization; causes blood-pressure wasting this body like worry does. That little brat – the mind – listens best to love, patience & restraint. Else, he can hurt the body that houses him. Self-realization is impossible if the body-mind equipment for experiencing such realization is damaged. Vedantambuja suryabham Sri Gurum saranam vrajet !! Millions of Humble prostrations to the lotus feet of Our Govinda Sadgurudeva !! “Let anger be our servant” !! We will rember this and try to control anger, with appaji’s Grace and follow Sadgurudeva !! Sri Guru Datta !! I hope, I can say from me, that I try always to restraint also in anger. Like this I could say from me, that I am a true seeker, and this I want be really. I want be a seeker who learns with success from my very deiar Guru Swamiji! JGD Puttuji. Appaji, with His immense love, has shown us the way to mold ourselves into a true seeker. Reminding us again is this MMS. By not being distracted by material attractions, by learning to calm and peaceful at heart, by being forgiving to everyone, by treading the Dharmic path, keeping our heart pleasant, all these are means to be a true seeker. The secret to all this controlling the mind. Praying to you, Appaji, to help us control our moneky minds. Oh Master of Puppets, You hold the strings of our lives. JGD SGD. “Showing restrain even in anger” this is actually a very difficult test. Desire/lust (Kama) can be controlled with effort and self restraint, But anger (Krodha) provoked by another person is very difficult to conquer. Rajarshis like viswamitra could conquer kama but succumbed to Krodha. later viswamitra had to do rigorous penance to conquer krodha and to become Brahmarshi. His Holiness always maintains Poise, remain pleasant and affectionate to devotees. We all must follow His Holiness example. Jaya Guru Datta, Swamiji! Passion and Anger….may Sri Swamiji as Divine Mother Chamundeshwari kill these two traits in us all…. it is important to control the upcoming anger. Chanting the mantra can help. What we need is the firm decision to change for good and seek Sri Swamijis help. JGD. Human beings have both animalistic and divine tendencies. Through the teachings and guidance of our Sadguru, we learn to control our indriyas and shape our behaviou and attitude toward Godhead. As we climb the spiritual ladder, we must be prepared for several tests which challege us to resist anger, temptation and immorality. Thanks Appaji. With your help I will work on this. Jaya guru Datta. Om namo Hanumate namaha. Very nice saying… we should not get angry at ourselves or others, when things do not happen our way.. restraining anger means restraining our mind. It is impossible for the mind to do two things at a time.. so lets always divert our mind into listening to His music , teachings so that our mind does not even have a chance to get angry. Please preside over our sense and hearts. Please rule over our minds so that we stay on track of our spiritual Sadhana along the path you dictate. Please grant that we control our anger and exercise patience and restraint in every endeavor. Only APPAJI can take us across the worldly maya to your abode in Vaikunta. Om Sri Datta Venkatesaya Namaha !! Anger is the first reaction in any undesired result of our life. Anger could be result of unsatisfied desires or due to unhappy feelings that could not be expressed…. Showing restraint even in anger needs intellectual understanding, on the root cause of anger. The answer will be as reaction of dissatisfaction for the end result, thus makes us realise “it’s me who is egoistic unable to control the desire for object and expressing it as anger”. Only by understanding this fact one can be aware of the reason for ‘anger’. Thus a true seeker with this awareness, shows restraint even in anger. 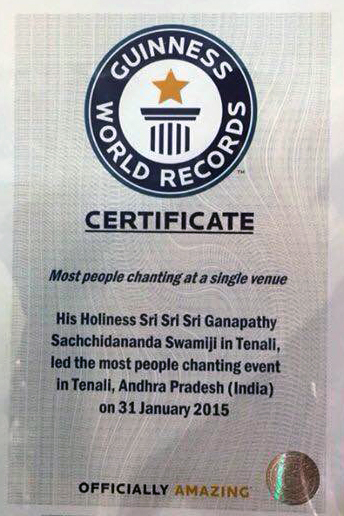 This is possible only by the grace of Guru. Thank You Puttuji for sharing this amazing video. No wishes, no anger … is it that easy? In theory yes. In practce one has to say stop, every time, like one`s own policeman. To be content is the best remedy, in my view. It would be difficult for any body to at least understand what he is doing. తండ్రీ, కోపాన్ని జయించి ఓర్పు, సహనంతో మసలుకోగల సాత్విక హృదయాన్ని మాకు ప్రసాదించమని వేడుకొంటు, శ్రీ దత్త వేంకటేశ్వరుని దివ్య చరణార విందములకు అనంతకోటి ప్రణామములు. I want to give a happy announcement after attending Swamiji’s concert at the majestic and beautiful Royal Albert Hall in London. But Swamiji has cured me before. Sometime around 2002 or so I was at the Mysore Ashram when Swamiji gave us a demonstration of a concert he was giving the following week in Hyderabad. He then told us he would address lower back problems amongst other illnesses. I had some back problems but I had not considered it a major issue. I only discovered how bad it had been when I woke up the next morning; I felt absolutely marvelous and my back was flexible and pain free. I then realized that I had been walking around in dull pain for years, and become so accustomed to it I wasn’t even aware of it! The material world is temporary, and the cure lasted me a good couple of years and recently returned with a vengeance. My backpain and problems became so bad in the last year that daily I had to lay down every few hours to manage the pain. I could only walk up to an hour at a time before my back problems would be unmanageable. I did morning stretches but it didn’t help. I went for physio therapy for 2 months but it didn’t help. So I was recently sent to have an MRI to try and find what is wrong with my back. Then about two weeks prior to Swamiji’s arrival in London I had a dream that an unknown and very humble Muslim saint appeared to me. I have no idea who he was and have no association or attraction to the Muslim faith. But he gently rubbed my back and then I woke up. In the morning I was free from backpain. It is now about three weeks and the pain has been fully gone but I continued to have a stiffness of the back. But today my back feels well; no pain, and hardly no stiffness. I will get back with you all later to allow some more time to pass and analyze it further, and report to you whether it remains. How lucky we are to have Swamiji. When we have a real Avadoota like Swamiji, we have so much protection that many people are not granted. We are not alone with our worries and problems. Imagine, there are over 3 billion people in the world – but WE have been granted access to Swamiji! How fortunate can we be?! There are no words to describe how blessed we are. Sometimes we forget or even think that no blessings have been granted to us at all. But we are indeed extremely fortunate. I want to encourage everyone to pray for Swamiji’s health, well-being, and protection. This relationship, this association with Swamiji, is not a one-way street where we only act like beggars. We too must give back to Swamiji. Recently Swamiji explained that he had suffered health problems that were very strong and left him perplexed. He even had to cancel some travels for a brief time. The evil in the world is very strong in the Kali Yug. We are right in the middle of the Kali Yug so things will get a bit worse for a few decades before they begin to improve. So after falling ill Swamiji composed over 400 raages to rid himself of these imposed problems — directed at him. It is our duty to pray for Swamiji. I am very grateful to Swamiji for dedicating his life to bring the wisdom of the raagas back into the world. Anger is ego and ego always wants to have the last word, i hope i will remember, with my humble prostrations . Namaste Puttuji. Nice video with beautiful photographs of Appaji, Venkata Ramana Swamy and a beautiful bhajan. Thank you Puttuji. A true seeker shows restraint even in anger is a good quote. Anger is needed to some extent for a sadhaka to protect oneself from other’s insistence for material objects. Anger, as it is used to protect oneself, sadhaka will get angry very fast by habit. So one must practice for controlled anger. Namaste Puttuji. JGD. I understand in Ramayana Ravana represents all man’s embroilment with passion. Anger is a most passionate vice. May we be second to second vigilant against this enemy with a fully developed internal Hanuman of self control and re-unite fully in our Rama, our Beloved Swamiji! JAYA GURU DATTA! Please, my beloved Sadgurudeva, help me to be calm and quiet and to have self-controle in every situation! With my humble prostrations to Appaji`s holy lotusfeet. S.G.D.! If we remember Appaji’s words, “Nothing happens except by the will of God,” then there is no room for anger in any situation. If something happens that is distasteful, you know that it is still happening for a purpose, by the deliberate will of God. It is happening to set things back in balance, in a manner known only to God. It is a great challenge, I do concede, but at such times, when we are provoked to retaliate in anger, if we remember that God is acting behind the scenes and is responsible for the situation at hand, it becomes easier to cool our tongues and to restrain our limbs. Sri Swamiji has also told us, “Change yourself before you try to change others,” It is best to look within for our own faults before striking someone else for theirs, either with words, hands, or things. “There is no penance that is greater than peace.,” and “Patience is the greatest penance” are other words of wisdom that have been passed on to us from Sri Jayalakshmi Mata through our beloved Appaji. Jai Guru Datta! Appaji’s beautiful picture is so inspiring to go inside and to deal with the inner ennemies in a loving and strict way until there is no feeling of anger anymore….one day….. with HIS GRACE! Thank you Appaji for this great MMS video message. Pujya Gurudeva’s form looks very peaceful, calm and pristine. Just by watching the MMS video, anger flies away. We will follow and instill these thoughts in our mind and control our anger at all the times. Ärger, einer der inneren Feinde, gilt es zu erkennen und zu meistern, was, wie SRI SWAMIJI uns im MMS vom 6.8. gelehrt hat, einen wirklichen Sieg bedeutet. Ich danke DIR, mein GOVINDA-GURU, für DEINE unendliche Geduld. that very day this mms was posted, after the wonderful ganesha celebrations by sri swamiji in london, there was a short moment where I was not able to restrain a burst of anger. I feel sorry for this and grateful for being shown where anger and rage is not yet under my control, although it improved considerably under sri swamijis guidance in the last years (I used to have a rather violent temper). it also makes me think about the blurred border between true seeker and would-be true seeker. unless I do not fulfil the requirements sri swamijis set for a true seeker I cannot claim being one. that day I failed, and I felt that uncontrolled anger not only hurts the person involved but our beloved sadguru as well. how much He forgives continually !